Which Factors Make For a Successful Business Website? We’ve all encountered businesses that have terrible websites before. So, we all know what problems can arise when a business fails to get its website right. It can immediately introduce the customer to the business in the wrong way. When a customer’s first impressions of a business are all wrong, then they might not stick around to learn more. That’s why those first impressions matter so much. They allow further interaction between the business and potential customers. If you’re creating a new website for your business or you simply want to improve the old one, there are some things it should have. The key factors outlined below are the ones that can help to make your business’s website a real success now and in the future. When someone visits your business’s website for the first time, they want to learn about the business. That’s why it’s so important to be clear when they first arrive. They should immediately be made aware of what the business does and has to offer to potential customers. You should have a banner at the top, underneath the business’s name, that outlines this information. Then the information and images displayed on the homepage should also make it clear what the business is about. You can go into further depth when you write the ‘about’ page of the website. Here you can talk about everything the business does, as well as the history of the business. The layout of the website needs to be easy to navigate if you want your website to fulfill its function. If people can’t get around the website easily, they will not spend time trying to do so. People don’t want to feel like they’re in a maze when they’re exploring a website. It’s not something that should ever be difficult or challenging for the user. It should be as straightforward as it can be. Including a sitemap is a good idea, but that’s just the starting point. The links should be clear, and having drop-down subsections under each category heading on the homepage is a good idea too. You need your website to be active and functional all the time if you want it to be a success. This is only possible if you are using a good hosting service. It’s worth shopping around and looking for the best deal. You’re going to need 24/7 assistance, so that problems can be fixed rapidly. This website allows you to get discounted prices on hosting, so this can make it more affordable. If the hosting service you currently use is proving problematic, and your website experiences a lot of downtime, change it. It’s one of the most important factors of all, so confront it. These days, many people stumble across websites. They search for something general and vague, and then they see what comes up. This is the reality of how people browse the internet and discover businesses. So, you need to make sure that you are prepared for this by making your website and its content SEO-friendly. By doing this, your website will instantly become a lot more accessible, and that’s what you want when you’re running a business. It’s more simple than you might think too. You just need to use the right keywords, adding lots of strong links and getting the page titles right. As long as you get those things right, all the basics will be covered. The images on your website have the biggest impact on its visual design. Strong images can really bring a website to life. But bad ones can stand out for all the wrong reasons. You don’t necessarily need to take your own images for the website, but this can help. Unique images that are specific to your website show a much higher level of professionalism. But there are also lots of stock images that you can use too. See what you can find, but ensure that they are relevant to your company and the design of the website. They also need to have the right resolution. There’s nothing worse than pixelated images on your website. It’s up to you to make sure that you change with the times. It’s the customers who decide how they will browse your website, so you need to meet their needs. These days, people demand flexibility, and it’s what you have to offer. The overall design of the website has to be suitable for browsing on mobile devices, as well as desktops. 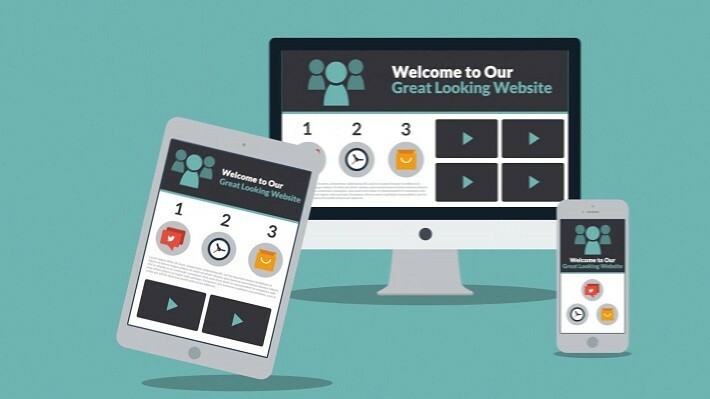 You can achieve this by making sure that the website has a responsive design. This hands a great deal more flexibility to the visitor because they can choose how they wish to interact with your content. It’s good for your business too because more people will be able to see what you have to offer. However well you set out the information on your website, there will always be extra questions that people have. This doesn’t have to be a problem though. The easy solution is to add an FAQ page. Here, any questions that are frequently asked about the business are answered. Adding this kind of page to your website is a good way of letting people know everything they need to know. And you will be able to cut down on the amount of people who contact the business asking questions. No business has the time to waste on those kinds of things, so this is something that definitely makes sense. Your website often acts as a link between the customer and the business. So, if they want to learn more or visit the store, they’ll have to have the right contact details. You need to ensure that the contact details of the business are displayed clearly on the website. Most business websites have a page dedicated to this. You should include a phone number, physical address and an email address. You could even include a simple contact form. This allows the user to type in a question or query and then send it off to you. You can then get back to them with a reply in your own time. Customer testimonials can be really useful when you want to show people that your business can be trusted. These testimonials are written by customers who are happy to share their positive experience with people. This then shows other potential customers that your business is one that can be trusted and relied on to get the job done. It’s amazing what difference this makes. It helps to reassure people in a way that can be quite difficult for businesses, especially small ones. So, next time you have a happy customer, ask if they’d like to contribute a testimonial to be displayed on the website. Security is a big issue when you’re creating and running a website too. If you’re selling things on your website, this is even more important. People need to be able to buy from your online store in confidence. They should be 100% confident that they are safe to enter their payment details. If they’re not, then they won’t be happy to make a purchase, and that’s not good for the business. You need to have SSL certificates in place to ensure that all communications are encrypted. This means that when a customer enters payment details, they can’t be compromised in any way. No website should try to sell items without sorting this out first.